A few weeks ago I wrote an article about how improving balance over your skis has significant benefits. 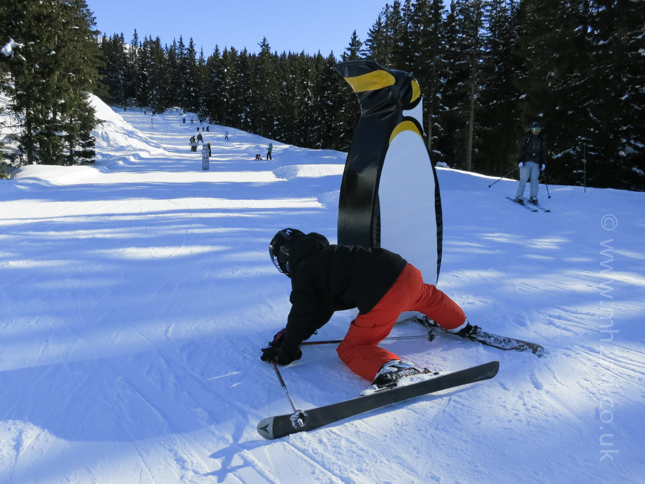 With plenty of weeks left of this winter still to come, I thought I'd write more on how we can improve our skiing, especially if you are coming out to Meribel. 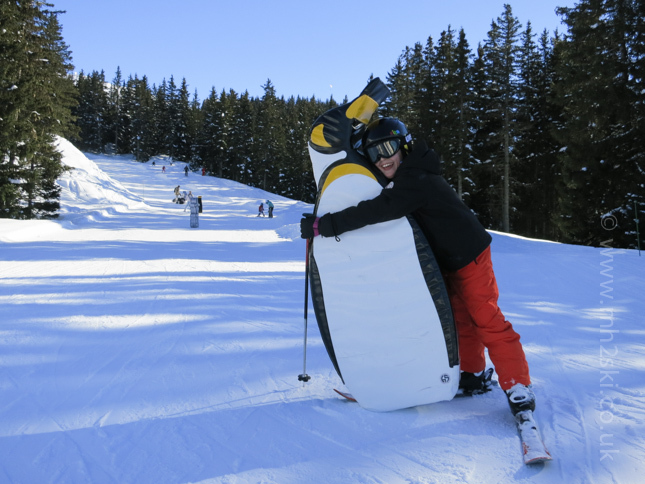 At the start of a private ski lesson, people will say to me that they want to improve their skiing and feel more confident. This means that their skiing performance will need to be analysed. But what does 'Skiing Performance' actually mean? One description of the word 'performance' in the Oxford dictionary is: A task or operation seen in terms of how successfully it is performed. This description is quite appropriate for skiing performance. So let us look a little deeper into how a skier's performance can be broken down, and put into five different threads; Technical, Tactical, Physical, Psychological and Equipment. 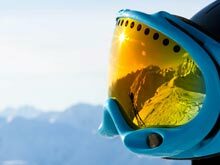 Technical - This thread is directly connected to what we should physically do with our body and skis. For example this will include positioning, movements and adjustments that we should try to make. Areas of technique are posture, rotation, edge and pressure control. An even more specific example of technique for a beginner skier would be how to progess from a snowplough turn to a parallel turn. The technical performance thread tends to be the one that most recreational skiers are keen on learning the most about during a ski lesson. Speaking from ski teaching experience, this is a very interesting subject. I will often ski with clients who have good technical understanding, but will have a vital part missing in their knowledge bank. Sometimes, just a small increase in technical comprehension will result in a compelling skiing performance gain. Tactical - How many of you watched the Sochi Winter Olympics last month? If you did, then maybe perhaps like me you became hooked on the curling events. Sure, sound technical performance was a critical part to success for Team GB, but so were the tactics. Much of Eve Muirhead's and Dave Murdoch's medal winning formulae was down to their tactical nous. How many guard stones, when and where to place them, and at what times were an important influence on the teams' performance. Another sport where tactics dominate is football. Before I go any further, for the record I have no strong team allegiance whatsoever. Most of the top premiership football players will have similar attributes depending on what postion they play. Their technical skill level and physical fitness, on the whole, will be similar except for the odd talented individual. What will often make a difference to a team's result will be the manager's tactics employed for each game. Managers like Jose 'The Special One' Mourinho and Sir Alex Ferguson are known tacticians. So how about tactics with skiing? Let's look at a beginner skier again. 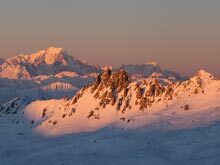 Meribel is lucky enough to have some excellent green pistes, especially at the altiport area where there are three different piste options. 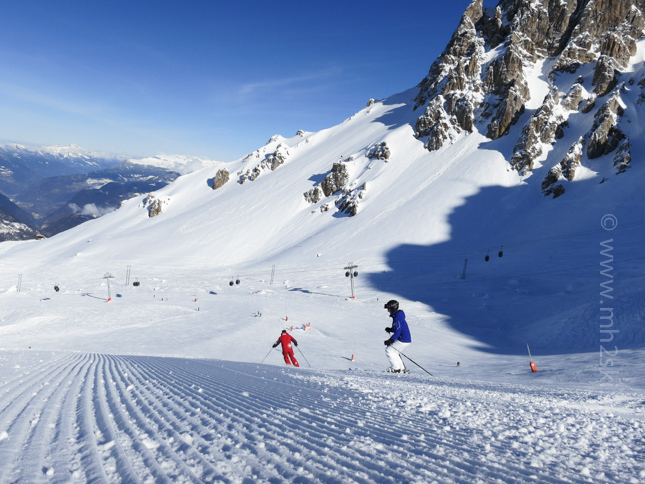 When I feel confident that a beginner skier is ready to leave the nursery slope and venture out into the big wide world of green pistes, I will need to choose which piste carefully. In fact, the line that I will lead a snow plough skier will also have an affect on their performance. If I select the most complimentary line, the skier's performance will generally be better, compared to a steeper line that could perhaps only be ten metres to the side. 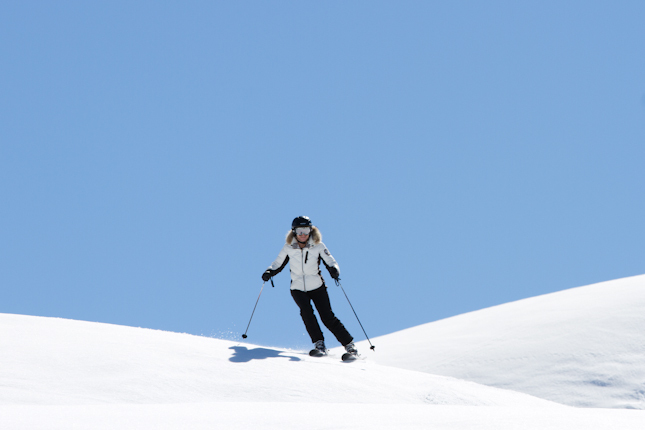 The skier's technique is the same, but the tactical decision will have an overall affect on their performance. 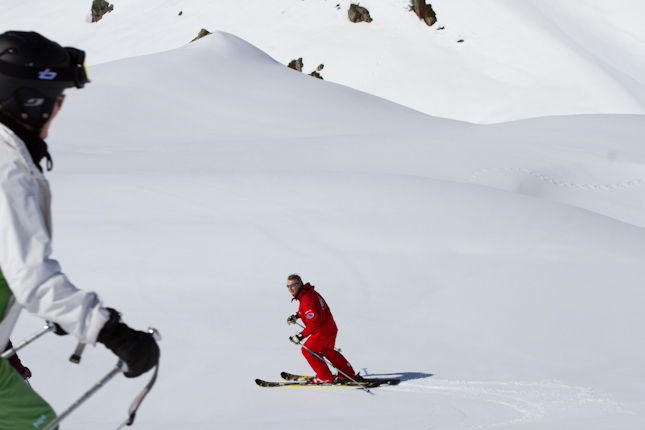 How about tactics with an off-piste skier's performance? 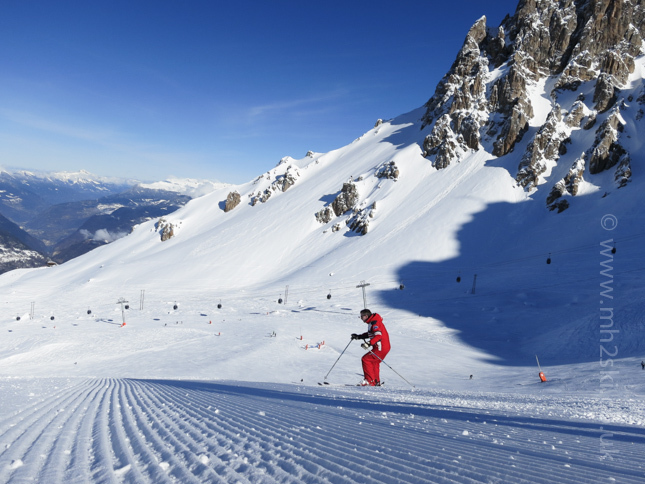 Take an advanced skier off-piste and their performance can change. Choose west facing slopes first thing in the morning, and generally snow conditions will great after a fresh snowfall. However take the same skier, with the same technical skills, onto the same west facing slope a few hours later in the day and the quality of the snow could be affected badly if the weather has transformed the snow. This will more than likely result in a slightly worse performance. Physical - This performance thread is perhaps one that we can all relate to. If you have fresh legs, then your performance will generally be better than say, at the end of a day when you will be more tired. Sufficiently fuelled with water and food will normally result in a better skiing performance than if you are dehydrated or suffering an energy low. How about if your muscles are feeling a little stiff? Or you are carrying an injury. Or even worse, and God forbid, a hangover is present due to holiday revelries !?! "Been there, done that" I hear you say, to any of the above. But it is true isn't it? So how can we look after the physical side of skiing performance? Train effectively before your holiday. Eat and drink well every day. Even attempt to get plenty of shut eye. Why not treat yourself to a massage whilst on holiday? Psychological - Boy oh boy, what an interesting subject this is, and where do I start? A large number of subjects can be covered here including visualisation, arousal levels, psychological thresholds, and just plain simple gut feelings. There are all sorts of resources available out there on this subject. Michael has written on this website about an increasingly well known sports psychiatrist called Dr Steve Peters and his 'Chimp Paradox' work. Dr Peters has had incredible success with a whole list of Olympic champions and other sport stars including Sir Chris Hoy, Sir Bradley Wiggins etc etc. He has even been in the news this week because the England Football Manager, Roy Hodgson, has announced that Dr Peters will be helping the England team with this year's World Cup. If you simplify this complex performance thread, it is basically what happens between the ears !?! We are all so very different. Again let me use a beginner skier's progression from a nursery slope to their first green piste. 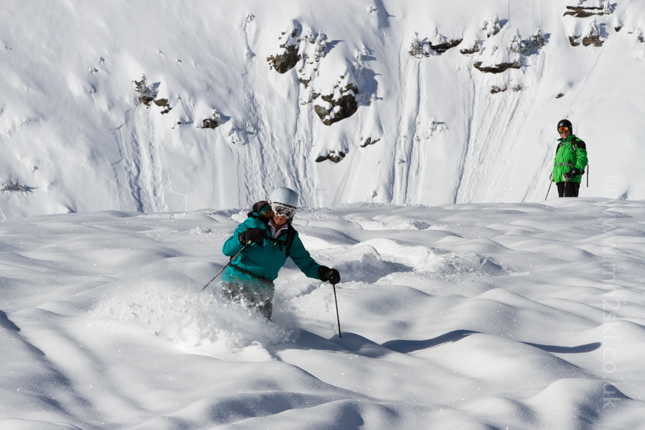 One skier might thrive with the new challenge and have a fantastic performance. Another skier might suddenly feel vunerable on a wider piste, and to being away from their secure environment of a nursery slope. 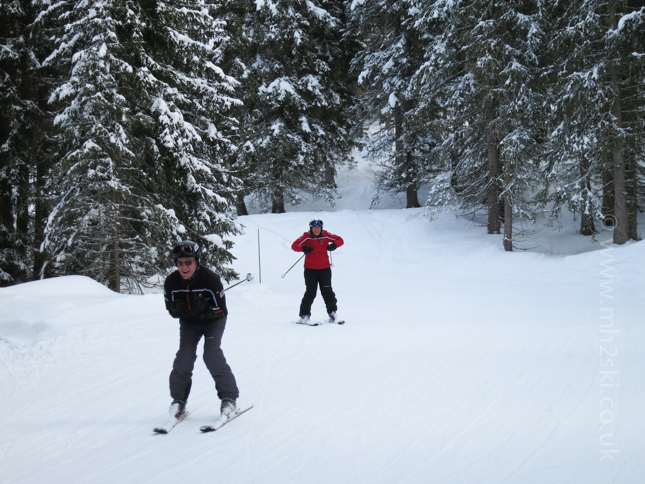 Or even being surrounded by other skiers whizzing past them. Both skiers could have a very similar skill level and physical state, the gradient and snow conditions will be identical, but their performances will suddenly vary enormously in this new environment. Likewise I've taken expert skiers off-piste to areas well away from the beaten track. I've stood at the top of a slope at what looks like an incredible pitch of perfect champagne powder. Skier 'A' might be thinking "Bring It On". Skier 'B' might be thinking "What if I fall". Skier 'C' might be thinking "I hope Skiers A and B aren't watching me". All three skiers may have the same technical skills, similar physical attributes, and have the same tactics, but their performance will be affected by their thoughts. Equipment - Wearing and using appropriate equipment can have a huge impact on skiing performance. A quick example could be someone wearing goggles when it is snowing heavily compared to someone wearing sunglasses or nothing at all which will greatly reduce the ability to see. 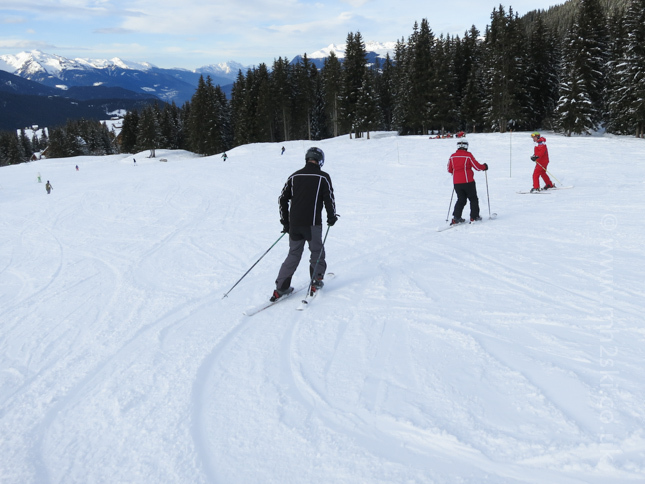 Recently serviced skis can also help a skier's performance for the better - sharp edges on compacted snow is one example. However I would like point out a few things that should take complete and utter priority in this performance thread - ski boots. It is vitally important that skiers are wearing correctly sized and fitted boots. Oh, and that they are fastened appropriately. 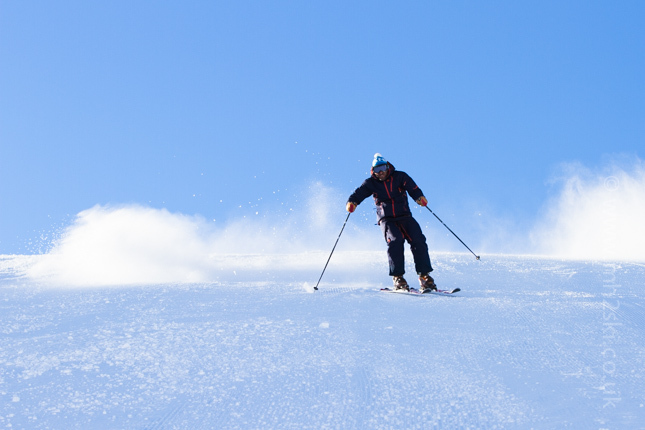 A few weeks ago I was skiing with a client who said to me "Martin, my skis are chattering and wobbling all over the place at the end of each turn, why is that?" My reply "Either your ski edges are railing (ie incorrectly serviced and tuned by a ski shop), or your ski boots are too loose." He looked down at his boots, pulled his ski trousers up, and promptly adjusted his boot clips by a few notches. Sure enough he skied off with a completely different performance. From personal experience I'm rather sensitive to ski boots. I dislike changing boots because it can be such an uncomfortable affair if it goes wrong. However recently it got to the point where my boot liners weren't holding my foot/ankle well enough, and I knew it was affecting both my performance and enjoyment. I went to see the chaps at a new shop here in Meribel called 'The Boot Lab'. A couple of productive hours later, I had a new pair of custom fit 'Intuition' boot liners and foot beds. Granted, I had to make a couple more visits back to the shop for some minor adjustments. But boy oh boy my new liners have made a such a difference, and helped improve my enjoyment of skiing even more. 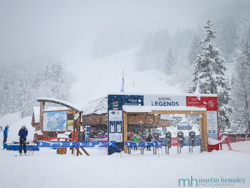 I can't recommend The Boot Lab enough, go and pay them a visit the next time you come to Meribel. This blog post has been a little bit longer than normal, but I really hope you have found it interesting and useful, and not too theoretical. After all, your ski holiday is so precious, and I suspect good and enjoyable ski performances are an important part of it. I have simplified and summarized each of these five performance threads in order to keep this article as short as possible. Don't forget you can click on any of the images to enlarge them. If you enjoyed this article you might be keen on reading another from a few weeks ago called 'The Balancing Act', click here for the link. Please feel free to share away on Facebook, Twitter and Goggle+ by using the social media buttons. Or leave a comment below, Michael and I would love to hear some of your examples of improved skiing performances and how these happened. Have a great week everybody. Martin.